‘Tis the ancestor’s breath in the voice of the waters. The dead are not under the earth..
thinking all of the people I love who have passed, I am always comforted by diop's poem and sweet honey's song. click here to hear the sweet honey song (unfortunately you only get one listen to the full song, then the site wishes you to purchase it, so, click carefully - unfortunately I can't find a version of this wonderful song on youtube.) the song was released on the album breaths in 1989.
here's another link to the song, I think the listens are unlimited, but it might take a few seconds to load. November first begins the Dia de los Muertos festivities with All Saints Day in which the deceased children are honored and remembered. November second All Souls Day is for the remembrance of the adult dead. 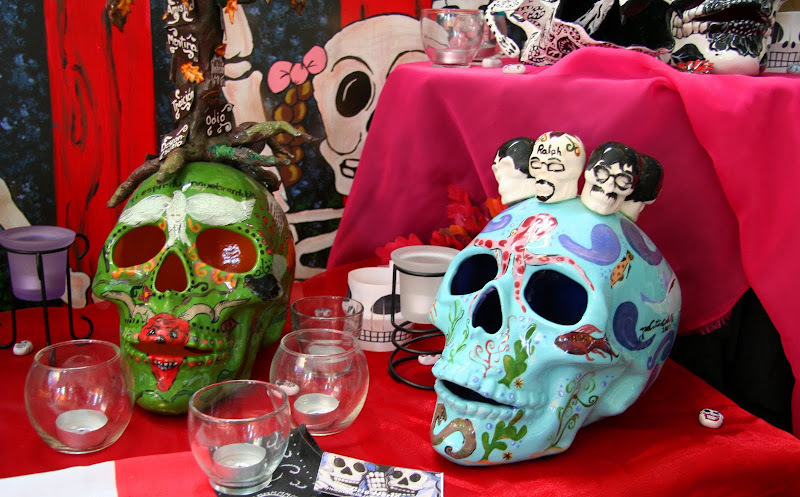 Dia de los Muertos combines these days to celebrate the deceased and enjoy their memories. The spirits of the deceased are thought to pay a visit to their families during Dia de los Muertos and the families prepare an altar for them. if you can find Diop's Tales of Amadou Koumba in English, don't miss them. Ahhhhh! It's always good to hear Sweet Honey in the Rock! And I love the El Dia de los Muertos altar. The Earth Is Alive:Long May It Be So. I LOVED this!!! You know I'm all about ancestors. Thanks, Kimy. Ditto. We never cease to be part of the universe. Great story as for me. It would be great to read more concerning that matter. Thanx for sharing this material.